Please welcome a new version of dbForge SQL Complete 6.1 with support for Visual Studio 2019, new command line interface and tunable Summary Panel. In Devart, we always keep up with modern innovations and try to provide our users with the ability to work with most recent environments, and Visual Studio 2019 is no exception. Our latest release of dbForge SQL Complete v6.1. already comes with support for Visual Studio 2019. A command-line interface is now supported in SQL Complete. You have the ability to automatically format SQL files as a pre-commit hook or as continuous integration (CI) validation step, which can greatly simplify the DevOps routine tasks. 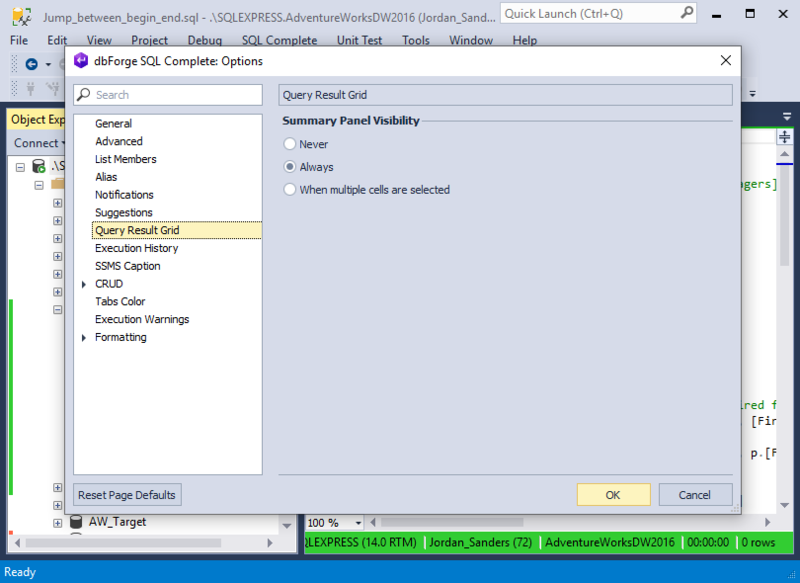 Tune up the behavior of the Summary Panel on the Query Result Grid. You can choose what suits you best: always show the panel, never show it, or show it only when multiple cells are selected. You are welcome to download the updated version of dbForge SQL Complete and send us your feedback.